Full ceramic bearing have excellence performance as special electrical and magnetism resistance, wear and corrosion resistance, lubrication and maintenance free when working, especially high and low-temperature application,etc.Could be used in awful environment and specially condition. The rings and balls made by full ceramic material: ZrO2, as a standard constructure, the cage made by PTFE, generally we also could make the cage with GRPA66-25, PEEK, PI, AISI SUS304,SUS316,Cu,etc. Full ceramic bearing made with Si3N4 have some better performance than ZrO2, the rings and balls made by full ceramic material: Si3N4, as a standard constructure, the cage made by PTFE,generally we also could make the cage with GFRPA66-25, PEEK, PI, phonemic textiles tube, etc. Compares than the material of ZrO2. 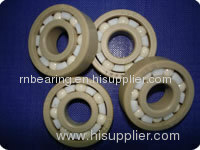 The SiN4 ceramics bearings could endure heavier load and could be used in higher temperature environment. Also we could offer precision ceramic bearing which generally used in high-speed and high-rigidity spindle, the manufactured clearance could be P4 to up grade. Full ceramic bearing of full complement balls has an add-ball gap on its side. Because using no cage design, the bearing able to install more ceramic balls than the standard construction, so the heavier radial load ability increased more.resistance and high temperature application. This series of bearing is not for high speed choice, it should be to install on the unforced. Ceramic cage has excellence performance as wear and corrosion resistance, high strength, lubrication and maintenance free when working. Adopting the ceramic cage, ceramic bearing can be used in the most inclemency environments as corrosive,low temperature, high vacuum. The normal used ceramic materials with ZrO2. Ceramic ball especially Si3N4 have the following performance as low density, high strength, low friction coefficient, electrical and magnetism resistance, wear resistance, well rigidity, lubrication and maintenance free when working, it is the best choice for rollers(inner ring and outer ring are made by metal) of the hybird construction ceramic ball bearing which are used in high-speed,high accuracy and long life environments. Normally, GCr15 or AISI44C, 316 ,304 makes inner ring and outer ring; The ceramic ball can adopt ZrO2, Si3N4 or Sic. The high performance stainless steel bearings can provides not only with the cleanliness and corrosion resistance characteristic also with the high accuracy and excellent wear resistance compare to the high carbon chrome steel bearings. The rings and balls are made of the material as a standard structure of stainless steel bearing. The rings and balls are made of the material AISI440C(9Cr18Mo or 9Cr18), the cage and the framework of seal adoption the AI304 or AI316, production accuracy couldreach ISO standard ABEC-1 and above, and the vibration level reach Z1 grade and above. We also can offer non-standard stainless steel bearings to meet some special type needs in engineering. Compare to high carbon chrome martensite stainless steel bearing. Austenite stainless steel bearings have even more excellent corrosion and wear resistance, magnetism resistance. The whole Austenite stainless steel bearings are made of AISI SUS316L(316) or SUS304(including inside and outside rings, balls and cage). Austenite stainless steel bearings can not harden completely by heat treatment, so it should not choose for heaver load or higher speed.